?From: “Brenda Lange”?Date: March 17, 2012 6:45:19 AM CDT?Subject: Blog March 17 , 2012? ?BUTLER KIDS DONATED “ KIDS” FOR OUR KIDS!? ?The Sun­day School Chil­dren of First United Methodist Church in But­ler, PA heard our plea for goats and ducks for our orphans in Mozambique. ?They sur­prised me last Sun­day with a check that will buy 64 goats and 50 ducks! ?They even had LIVE GOATS on stage with me as they pre­sented the check!? ?I asked the Lord last Sept. to help me expand our goat herd to 100 goats, and He’s mak­ing it happen. ?At present we have 10 adult goats in Balama which have pro­duced 7 new baby goats since last September. ?Since Decem­ber, nine goats were donated by indi­vid­ual sponsors. ?Thanks to these gen­er­ous dona­tions, we can now expand our herd to 90 goats!? ?These goats and ducks will serve as our breed­ers to pro­vide “starter herds” for our older orphans liv­ing in remote villages. ?Those orphans inter­ested in rais­ing goats or ducks will attend a train­ing class to learn how to prop­erly care for and mar­ket these animals. ?Goat meat and duck eggs/meat are in high demand in Mozam­bique, mak­ing this a very prof­itable way for our orphans to make a liv­ing.? ?THANK YOU to all of you who have made this goal a reality!? ??? ? ? ? ?? ?PERSONAL NOTES TO BRENDA?brenda@orphansunlimited.org?ALL OTHER INQUIRIES:?LINDA FERGUSON?linda@orphansunlimited.org?phone: 979–234-3422 or 713–854-9197?Brenda’s Blog is Posted at:?www.orphansunlimited.org/blog?or SUBSCRIBE to receive the blog by e-mail. ??? ?BUSH BUNNY FLYS TO AFRICA ON APRIL 3RD. ?God has pro­vided a pow­er­ful team of expe­ri­enced peo­ple to help us move 550+ TONS of corn and beans this year. ?We plan to enlarge our pro­cess­ing team, mak­ing it pos­si­ble to sack and stack 40 tons a day vs. our 25 tons/day last year.? ?Don Hits­man from Michi­gan, an expe­ri­enced mis­sion­ary who super­vised the barns for us last year. ?Kaylan Vollmer­ing, expe­ri­enced short term mis­sion­ary, grad­u­ate of TX A&M, and cur­rent RN stu­dent at Con­cor­dia Un. In Austin, TX. ?David Abel, expe­ri­enced mis­sion­ary and Agron­omy stu­dent at Kansas State, Un. ?Bryce Vaughn, AFA coun­cil mem­ber and Agri­cul­tural stu­dent at Nebraska Un.? ?We are very excited to work with this awe­some team of peo­ple who will arrive in mid May to help us fill the barns for 2012.? ?Blessings,?Bush Bunny Brenda? ? ? ? ? While I’ve been shar­ing God’s vision with all of you in the USA, Eric, Linda, Mon­ica and Joy were work­ing faith­fully to man­age our min­istry and orphan pro­grams in Mozam­bique. This is the lat­est news sent this week. CHRISTIAN RADIO EXPANDS TO A 3RD LANGUAGE! You can tell the Evans Bap­tist Church, LA, that the Maconde lan­guage pro­grams began broad­cast­ing today (March 9) at 3pm. Please thank them from all the Maconde speak­ing peo­ple in the Balama dis­trict. This is the first time EVER that MANY of them will hear the TRUTH about JESUS. These pro­grams are in the form of sto­ries acted out by sev­eral per­sons, it sounds really good. BELOW IS LINDA’S LATEST NEWSLETTER A LATEST PHOTO OF DIXON (the mal­nour­ished baby fea­tured in our 2012 DVD disk). He is now healthy at 7 months of age. When we res­cued Dixon in Novem­ber, 2011, he weighed only 7 lbs. 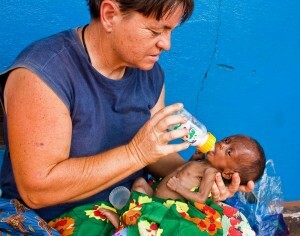 at 4 months of age (ema­ci­ated and near death). Thanks to your love gifts, we can buy life sav­ing baby for­mula and food so that Dixon as well as 100’s of other mal­nour­ished babies are saved each year. Mozam­bique is con­tin­u­ing to have rain and will have for another month. It breaks my heart to see so many babies sick from Malaria and so many other dis­eases which seem to mul­ti­ply in the rainy sea­son. We loose more babies to Malaria and diar­rhea than any­thing else and it seems like it is more this year. Per­haps it’s the same but it seems to be more to me. Baby Dixon came to us shortly before I arrived and Brenda fought to keep him alive. 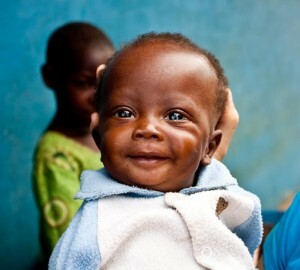 He is now in our baby pro­gram and is a happy and healthy baby. Look at that smil­ing lit­tle face! Praise God for the lit­tle Dixons that are all helped through our Baby project. We have been able to visit a few of the vil­lage churches since I returned. I love going to the outer vil­lages to preach the word and see God mov­ing among the peo­ple. Two girls from South Africa named Mon­ica and Joy have been here help­ing us with many things and have been a bless­ing to the peo­ple. They both sing so they have been help­ing to record the radio pro­grams as well. As of this week Eric has expanded the radio min­istry from 3 times a week in Balama to include another 3 times in the larger town of Mon­te­peuz. The gospel is now broad­cast 6 times a week in Por­tuguese and Makua on 6 dif­fer­ent days. Today is prayer walk day. Once a week I go with the ladies prayer walk from the church and we walk to homes in the vil­lage to pray for peo­ple who are sick. Today we also will visit a fam­ily who had a death in the fam­ily to pray with them. Every­day comes with new oppor­tu­ni­ties to show the love of God around us. One of my Favorite songs is “Wont you be my love” by Mercy me. It speaks to my heart about the love we are sup­posed to take to a bro­ken world. All we have to do is look around us to see hurt­ing peo­ple no mat­ter where we are. Your mis­sion field may be next door or where you work. Don’t miss the oppor­tu­nity God has placed in your life to min­is­ter to oth­ers. or SUBSCRIBE to receive the blog by e-mail.